You’d be hard-pressed to find a stamping company that isn’t looking for ways to improve operations and reduce costs. Stampers tend to address these issues by examining equipment costs, tooling and processing methods. Yet, lubrication usage is often the overlooked low-hanging fruit that can push efficiencies throughout a manufacturing facility by lowering costs, improving quality and achieving higher throughput. When it comes to lubrication usage, most stamping companies simply look at the cost of the lubricant over the course of a year, but many do not have a holistic view of the total cost of use. Although the costs for lubricant and its waste removal are tracked, stampers need to be aware of other hidden costs in a lubrication program. Reduced downtime: Companies tend to underestimate downtime for lubricant changes, which involves cleaning the applicators, repositioning the sprayers and so on. This is especially true when it comes to hand mixing and hauling buckets of lubricant to the press station. Each time the operator turns off the press to refill the reservoir, time is lost, which adds up to a large cost for lost production. To get an idea of the extent of those losses, a simple formula (see page X) can provide a quick idea of how much money is being left on the table. Improved productivity and quality: Another potential negative cost impact of poor lubrication usage is an inconsistent or poor production rate. Good lubricant application makes metal forming tooling run smoothly, steady and predictable. Inconsistency in the lubricant or the application can cause erratic, unpredictable output, which can mean scrapped parts as well as lower production rates and damage to tooling. Reduced lubrication costs: The volume of lubrication disposal is directly related to the amount of lubrication used and recycled. Typically, companies follow a “more is better” approach, using a richer lubricant mixture than necessary. However, each time lubrication usage is reduced, disposal costs are reduced. These savings should be considered when looking at the capital outlay required in a lubrication management system. A mechanical mixing system can address various processing requirements, plus it ensures a consistent and correct lubricant/water dilution ratio, which is a key to cost savings. Elimination of variation: Potentially contributing to the issues stated is the “human” factor. It’s not out of the ordinary for each shift to have its own method for mixing and applying lubricant. This might include adjustments in the automation for positions and speeds as well as individual tweaking of each application, resulting in quality variations and production delays shift to shift. Additionally, the current low unemployment rate in conjunction with the aging and retiring workforce has created a manufacturing skills gap with many new workers lacking plant-floor knowledge and experience. This leads to inconsistency across the various shifts as individuals not fully trained in lubrication management take on these responsibilities. Improved environment: Given ISO 14000 environmental mandates, using less lubricant is one way to produce less waste to haul away. Additionally, better control of lubricant application means less overspray for employees to breathe, as well as a shop floor free of lubricant puddles, which means a safer and healthier workplace. A good lubrication management strategy all stems from one simple word: consistency. This begins with accurate and thorough mixing of the lubricant/water solution. Improperly prepared mixtures can separate before and during use, causing equipment to operate inefficiently. This leads to product quality issues while adversely impacting productivity and tool life, to say nothing of how imprecise lubricant mixtures can add significant cost to operations. Most of the time, a company can evaluate mixtures using a refractometer, which measures the amount of solid content to see if it’s properly mixed. Whether companies are hand blending based on the supplied mixing charts or buying pre-mixed lubricant, it’s common to see inconsistency from batch to batch. More often than not, a mixture is too rich, which can add up to significant cost over time. For example, consider a mixture ratio of four parts lubricant to one part water (4:1) with a raw lubrication compound cost of $12 per gallon. This adds up to mixed-use cost of $4 per gallon. An effective way to measure lubrication consumption cost is part-per-part (PP cost), using the following formula: Mixed lubrication cost/number of parts produced = actual cost per part. Ineffective lubrication mixing, whether by hand or equipment, can lead to inconsistent results. If a refractometer check reveals that the 4:1 desired ratio is actually 3:1, this means there will be a 25 percent increase in cost per part. This simplified lubrication formula can provide a quick idea of how much money is being left on the table. A common approach to consistency is to order pre-mixed lubricant. However, shipping fees end up as a hidden cost of any lubrication strategy. Consider the purchase and shipment of a 300-gallon drum of a 50:50 lubricant-to-water mixture, meaning the purchase and transport of 150 gallons of water – a virtually free item when mixed on-site. Therefore, a better strategy for achieving consistency and cost effectiveness is through on-site mechanical mixing. With these systems, the lubricant concentrate and water can be accurately metered, systematically combined, thoroughly mixed and dispensed. Additionally, mechanical systems offer the flexibility to make proportional changes to the mixture as needed for a variety of applications. Plant-wide lubrication systems come with all the piping needed to deliver lubricant directly to the stamping presses. Unsurprisingly, the proper application of the lubricant is just as important as proper mixing. Similar to the “more is better” approach in mixing, companies are sometimes prone to applying more lubrication than necessary. The result includes puddles of lubricant on dies, at the bottom of the press pit and on the floor due to over application. In addition to being a total waste of costly lubricant, it also results in the loss of valuable time. Application devices vary from drip buckets, mops and roller coaters to electronic airless spraying systems. The optimal approach depends on the particular application. However, electronic airless sprayers often offer more flexibility, reliability and precision, but require pre-pressurized lubricant regulated to a precise pressure within a manifold assembly. With this approach, each manifold assembly is comprised of a number of injector valves, each independent of each other. This means each can be adjusted to apply a particular amount of lubricant at a particular location at a precise press interval. For facilities with numerous presses, it’s recommended to move toward a plant-wide lubrication system. With this approach, lubricants are thoroughly mixed at a central location and distributed via an in-plant piping network to presses located throughout the manufacturing facility. The benefits of these systems are numerous – consistent lubricant is available as needed at each press, almost no labor costs are associated with the process, and both lubrication cost and waste hauling is reduced. With these systems, companies can cut their lubrication costs by 50 percent or more. Key to this solution is that once the process is set, it has a lock-down feature that prevents tampering, building consistency from shift-to-shift. Plant-wide closed-loop lubrication systems through Industrial Innovations start with a Pro-Mix proportional mixer and all the piping needed to deliver the lubricant to the presses. Depending on the mixing system in use, two to three different lubricant mixtures can be supplied to each press for various material applications as well as monitoring systems for automatic mixing and dispensing and built-in diagnostic capability. 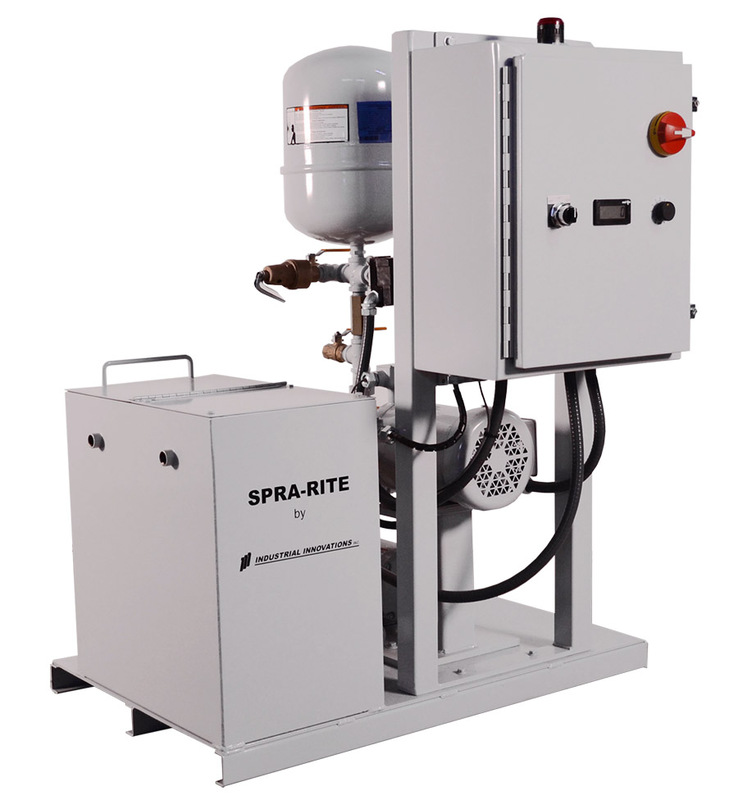 The lubricant mixture is then applied using a Spra-Rite electronic airless application system with zero-drip nozzles. Each of the injector valves can be independently programmed with settings for skip cycle counting, delay spray, volume control and length of spray – all allowing for precise positioning and application of the lubricant to the workpiece. 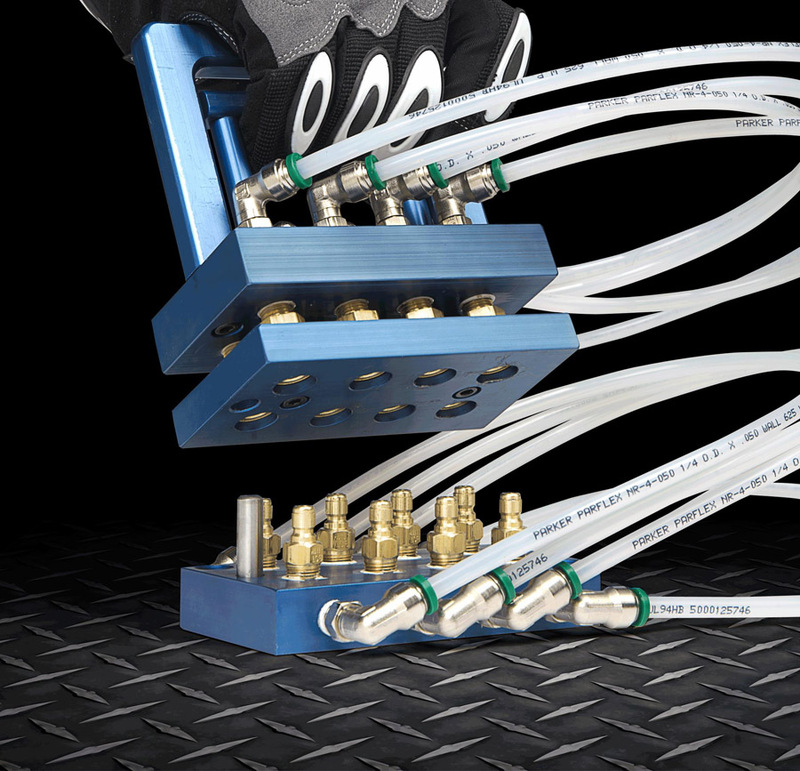 A quick-change manifold enables “one-click” disconnect of multiple hoses, eliminating setup time and confusing lube line hookup. 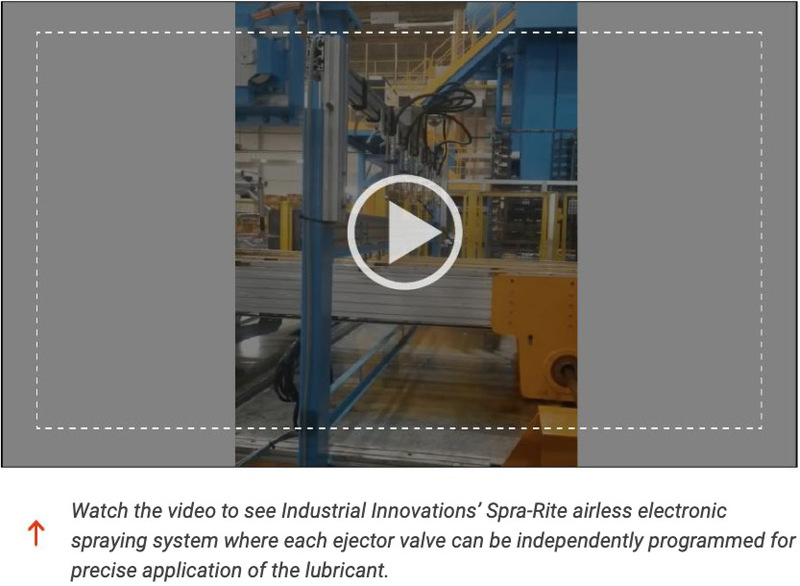 Another way to increase consistency and reduce downtime is through the use of a die-mount spray-nozzle quick-connection solution, where all nozzles are permanently mounted to the die versus variable placement using magnetic mounts. During die changeover, the operator simply unclicks the quick-disconnect manifold and removes the die. The new die is positioned and the new manifold plugged in. The operator loads the part program and spray profile for accurate volume, placement and timing of the lubricant. Although a closed-loop lubrication system can function with just the mixer and applicator, companies can reduce cooling requirements by as much as 70 percent with the installation of a reclamation and recycling unit for coolant purification. No matter the number of stamping presses in a facility, don’t underestimate the value of good lubrication management. 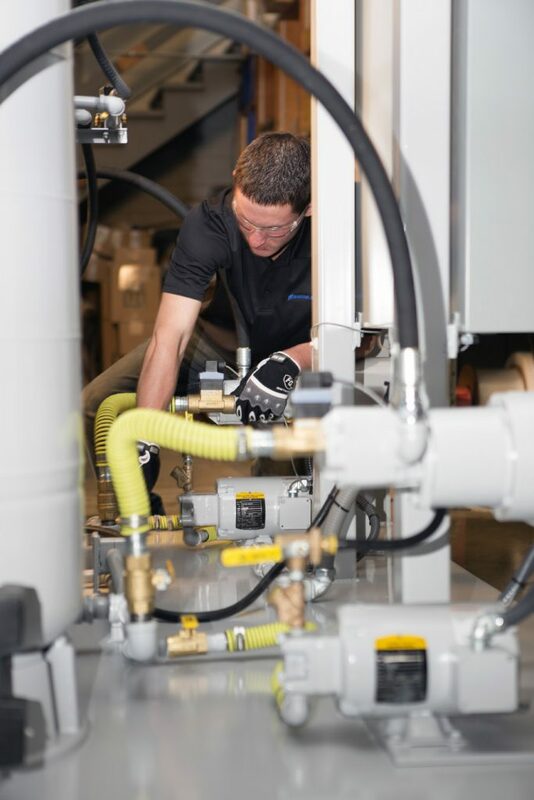 Investing in mechanical lubrication mixing and application systems can build consistency and accuracy into a process and enable quick ROI gains while also contributing to a healthier workplace and environment.